Autumn will see the return of the Disney On Ice UK tour. 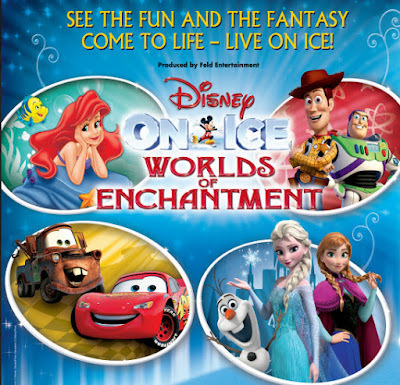 The Worlds Of Enchantment Tour will run from 25th September, arriving in Manchester on October 14th. This year for the first time characters from Frozen will be included in the show, alongside Cars, The Little Mermaid and Toy Story. 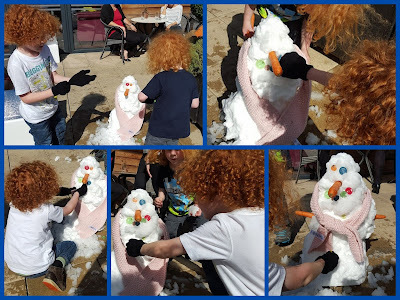 To celebrate Frozen joining the show we were invited to join some other blogger and journalists and their families and we were asked "do you wanna build a snowman?". 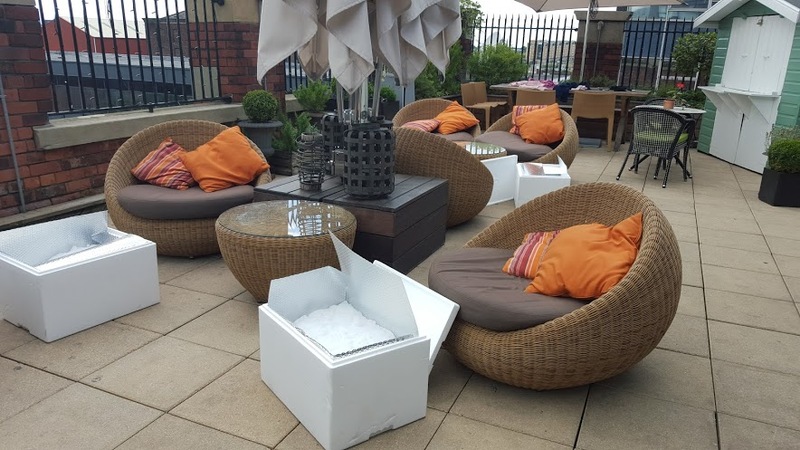 It turns out snowman building on a rooftop in Manchester in August is even more fun than it sounds! The PR's had obviously been enjoying themselves before we arrived, and they had set the bar high with some very impressive snowmen.. 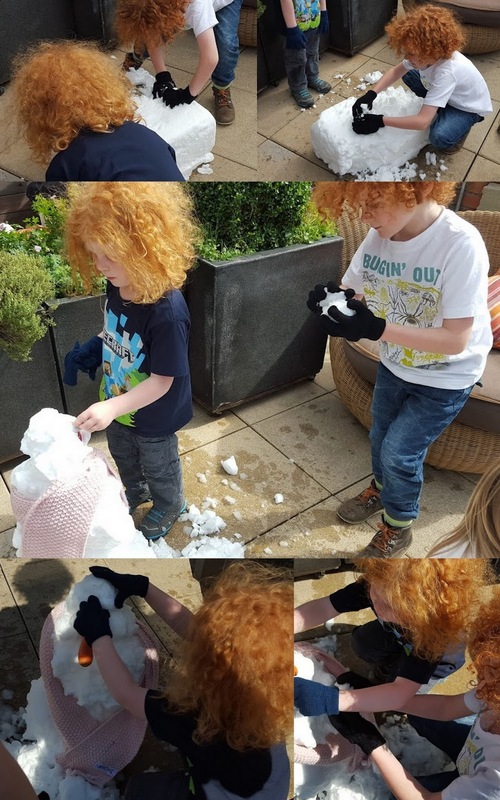 It really didn't take my 5 and 6 year olds very long to get stuck in - once they had checked that it really was genuine snow! We decided to tip out our snow in one and see if we could make our snowman from the big lump we had. Turning it onto it's end proved a bit more tricky, but he was still tall enough - especially once the lads added a head from some of the fallen snow. 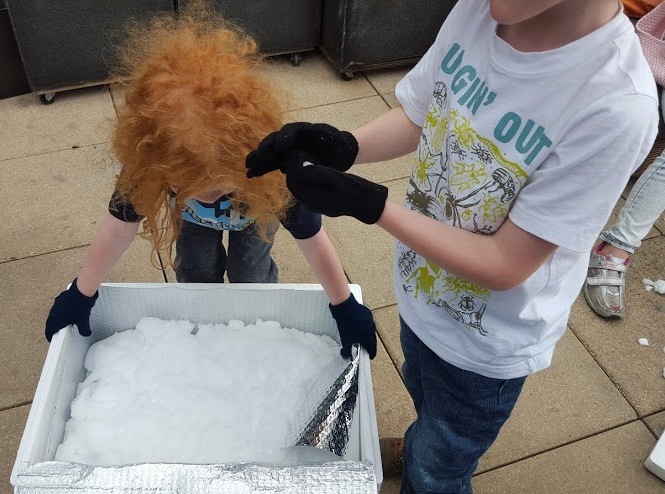 The boys really worked as a team, and it was lovely to watch them laughing and sharing ideas - and they didn't argue! 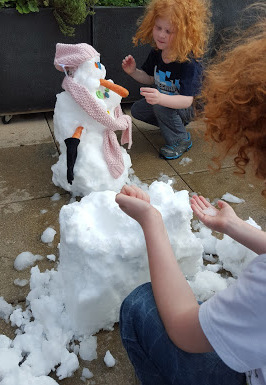 It turned out that my 5 year old is a bit of a snow engineer, and he was the mastermind behind making the design work while my 6 year old explained to him where he felt everything should go, and what accessories the snowman should have. 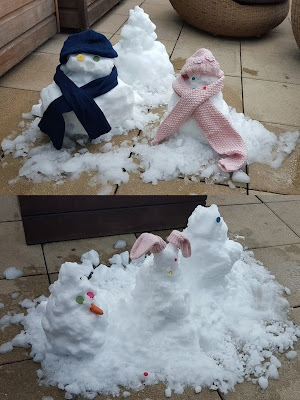 And when they'd finished they were rightfully proud of their creation! 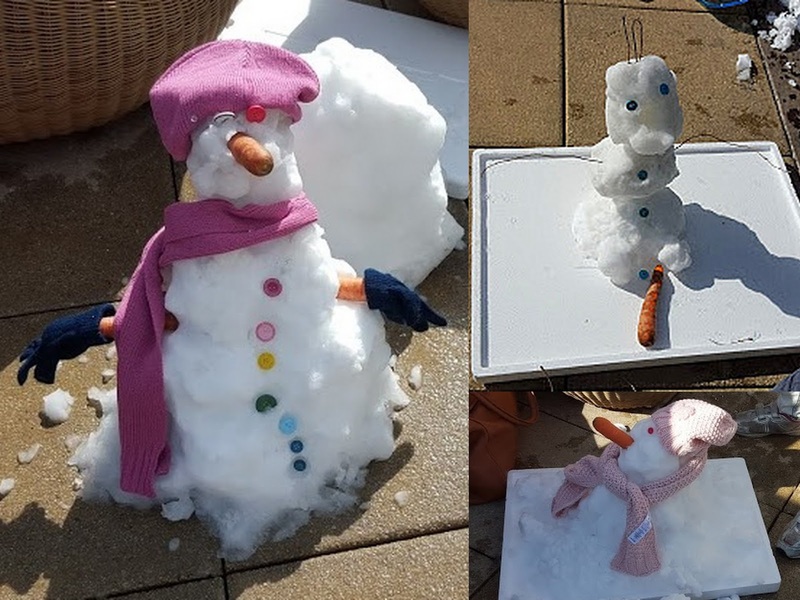 The other children and grown ups taking part had also made some great snowmen - these are the creations from Lancashire Lass, Tired Mummy Of Two and Simslife. 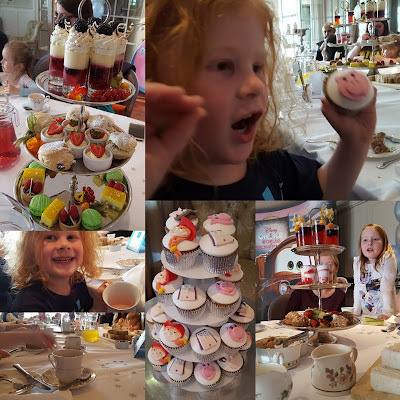 All that hard work made everyone ravenous and we went indoors for a proper afternoon tea. 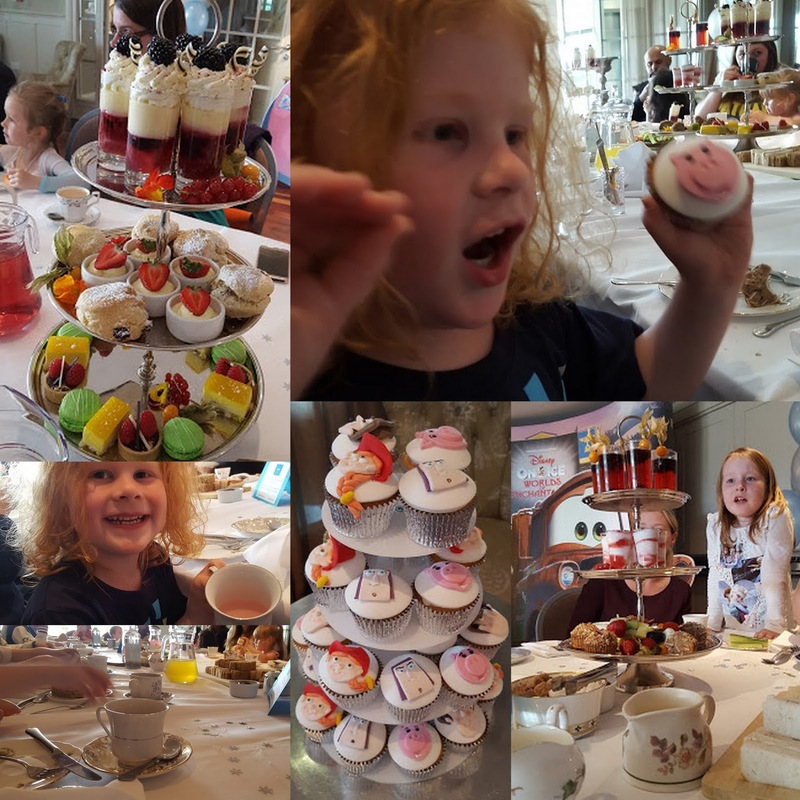 My 5 year old adored his cup and saucer, and everyone was completely smitten with the marvellous array of food laid on by the Great John Street Hotel, and the amazing Disney cupcakes. We all had an excellent afternoon, it was an unusually sunshine filled Manchester day, and getting to play with real snow while wearing a t-shirt is a rare thing indeed! We will be reviewing the Worlds Of Enchantment show in Manchester, and I really can't wait. I first saw Disney On Ice in Nottingham in 2003 and it was awesome enough then. The skill of the performers is breathtaking, and the Disney costumes and props are so extravagant and over-sized that you get an excellent view wherever you are seated. Disney On Ice 2015 Worlds Of Enchantment tour will be at Manchester Arena from 14th-18th October 2015 and will be appearing across the UK from 25th September to 29th December in Glasgow, Birmingham, Newcastle, Manchester, Sheffield and London. Prices vary depending on the venue. For more details and to book tickets please visit the Disney On Ice website and stay up-to-date with news and information by following Disney On Ice on Facebook and Twitter. 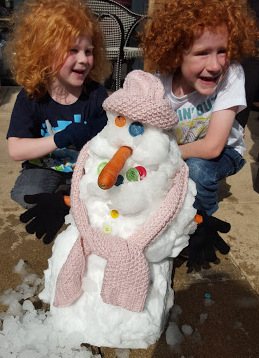 Well done boys, great snowmen. What a surreal experience but I can see they had great fun. Looks like a great time was had, and they definitely did well building the snowman - awesome! Wow! That is so fun! 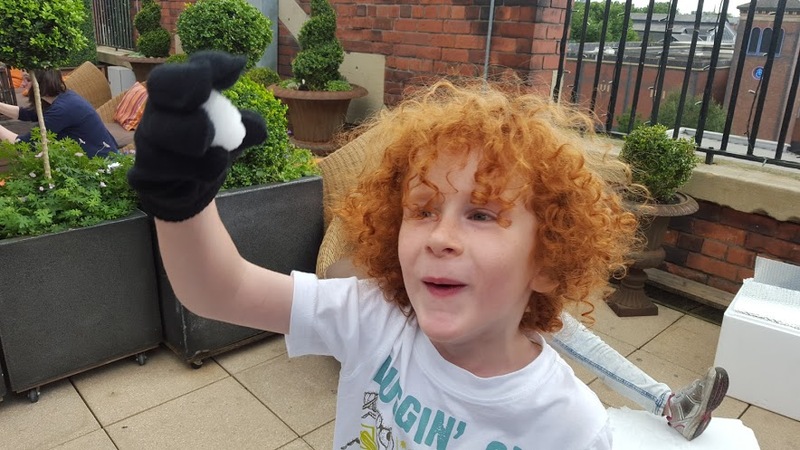 Snowman in August! Looking forward to read your review!